I wanted to be one of those successful people I always heard about. You know, the ones who jumped out of bed excited and motivated in the morning. People like entrepreneur Sir Richard Branson or the world’s top performance coach Tony Robbins, who are able to get up early, be productive, and carry that positive momentum into the rest of their lives. But I just didn’t think it was possible for me. You see, I wasn’t a morning person…and I certainly wasn’t someone with a lot of discipline. So it was always just a want. Over the last few years, I’ve discovered that creating a productive early morning routine is something a lot of people want, yet few actually do. Do any of these all-too-common statements sound familiar to you? I went to bed late last night, so I can’t get up early because I need my sleep. I had every intention of getting up early this morning, until morning actually arrived. There’s too much going on in my house in the mornings and I never have any time for me, so what’s the use? I know what I should be doing in the mornings but I just don’t have the discipline or willpower to actually do it. If you are nodding your head in agreement with some or all of these statements then this guide is for you. I used to set myself up for failure every morning…without even realizing it. I’d wake up around 7:30 or 8 AM to my phone’s annoying alarm. I’d immediately hit snooze and then repeat this process a few times. Once I got myself stressed out enough from all of my silent worrying and complaining, I’d pick up my phone and start going through emails. This would then add another layer of anxiety onto me. I’d quickly reply to all of the important and urgent messages that had come in since I last checked (which was right before I went to sleep the night before). 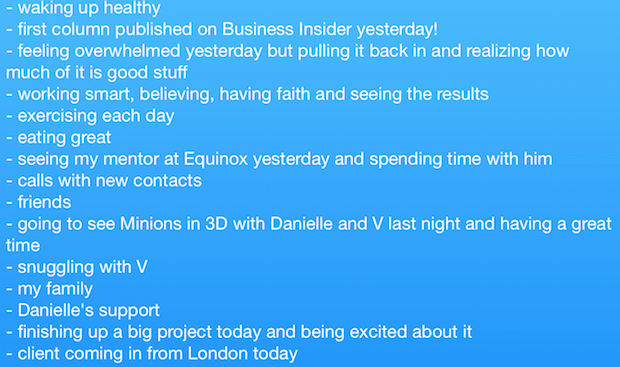 My anxiety level would rise as I mentally pictured how hectic my day was going to be with all this added onto it now. All of this before I even got out of bed! I had no idea how much damage this twenty to thirty minute routine was actually doing to me…and I certainly didn’t have any clue how much a positive morning routine could change my life. 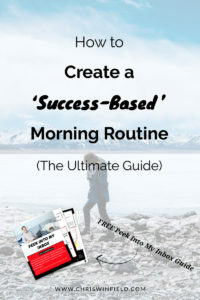 So if you’re anything like I used to be and you want to make your mornings more productive, enjoyable and your days successful – that’s exactly what I’m going to show you how to do in this guide. 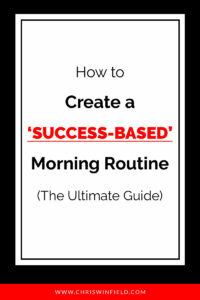 You’ll get the exact tactics, strategies, hacks and research that I used to create and ultimately perfect my secret weapon…and it will give you an exact step-by-step blueprint to create your perfect morning routine that will set you up for success every single day! Free Bonus: Click here to download a FREE beautiful PDF version of this 42-page guide. You’ll also get access to a special bonus area with additional tools, guides and checklists. #1. Why Do You Need a Morning Routine? What’s In It For You? So, why start a morning routine? At the simplest level, it will help you to overcome procrastination, be a more positive, healthier person, and set you up for success each day. Sounds pretty good, right? Also, sounds a little too good to be true, doesn’t it? That’s what I used to think too. So let’s dive into the WHY behind all of these benefits. How different would your life be if you were in a better mood and had a happier disposition? According to a study by the American Psychological Association, by creating and following a morning routine, your stress, depression, and anxiety levels will start to plummet and your life satisfaction levels will begin to soar. You’ll notice that you feel more motivated and your to-do list will seem less daunting. Morning routines provide physical benefits too. They make you feel more energetic and strong. Plus, when you use the time after you first wake up to do some heart-healthy cardio, muscle-building strength training, body-stretching yoga, or even go for a walk, you’ll also enjoy better health. You’ll likely even eat fewer calories. A study conducted by Northwestern University discovered that, overall, late sleepers ate more calories on a daily basis. Specifically, they ate more at and after dinner, and they also tended to eat more fast food and fewer fruits and vegetables. Over time this means a higher risk of obesity and all of the diseases and conditions that come with it. Physically, the reduced stress that you’re likely to experience means a lower risk of heart attacks and strokes, which is a major plus when it comes to living a long, healthy life. When you use your morning routine to engage in some type of centering behavior like meditation, journaling, or practicing visualization, you feel more at one with yourself and the rest of the universe. You have this sense of inner peace that can help you through the chaos that you may be experiencing at work, home, or both. I was meeting with a client for the first time the other day and I asked him to rate his “Time for Me” on a scale of 1 to 5 and he couldn’t even comprehend what that meant because, as a father and CEO of two successful companies, it had been so long since he had any time for himself. A morning routine helps you to intentionally create time for yourself to focus on yourself and can even improve your business. According to a study conducted by biologist Christoph Randler, mornings are also when people tend to be the most proactive and productive. This means that you have an easier time heading off problems while getting more done at the same time. “How you wake up each day and your morning routine (or lack thereof) dramatically affects your levels of success in every single area of your life. Focused, productive, successful mornings generate focused, productive, successful days—which inevitably create a successful life—in the same way that unfocused, unproductive, and mediocre mornings generate unfocused, unproductive, and mediocre days, and ultimately a mediocre quality of life. “#2. But I HATE Mornings and That Will Never Change!” Or Will It? Now, if you’re someone who absolutely, unequivocally hates mornings…you might be thinking that all of these benefits sound great but it’s just not possible for you. Well, I’m here to tell you that doesn’t have to be true. I used to hate mornings. They were right up there with SPAM emails and people who kick puppies. And, like you, I struggled to not only create a positive morning routine, but to even wake up early. The key to successfully creating a morning routine actually lies in your mindset. It begins with making a decision and overcoming the “I’m not a morning person” invisible script that you have created for yourself. So if you keep telling yourself that you’re not a morning person, guess what? Your mind is going to make sure your belief is true. Once you recognize that you have the power to change your own mindset and beliefs, it’s important to look at your habits and how successful you are at creating and sticking them. What keeps you from sticking to good habits? This means that making yourself into a morning person—both during the work-week and on weekends—means finding ways that make it hard to go back to old habits. It involves facing your fears of failure, getting and keeping yourself motivated, limiting your distractions, and learning to manage your time. It also requires picking yourself up when you falter, never allowing yourself to give up. Think about the last time you tried to wake up early on a regular basis. Got that image in your head? Okay, at the beginning, your motivation was probably pretty high and you were ready to tackle the world, right? You went to bed earlyish, you set your alarm to get you up at the crack of dawn, and you were confident that you were going to rule the day. And it might have worked like this for a day or two. However that inevitable day comes when the alarm goes off and your motivation is nowhere to be seen. This is when you decided to hit the snooze and stay in bed for a few more minutes (or hours), fully convinced that today wasn’t going to be your day. Sound familiar? I learned a lot about willpower and motivation from Nick Winter who wrote The Motivation Hacker. Nick points to research from psychologist George Ainslie explaining that will is simply the process of making personal rules for ourselves that will help us reach our goals. How much willpower we can muster is precisely how good we are at setting up these personal rules so that we always prefer to keep our rules than to break them. The good news? This is a learnable skill. So what can you do to help you achieve more structure and consistency? For starters, you want to focus on making your morning routine a habit. One way to accomplish this is to use Rob Norback’s ‘Habit Starter Checklist’ which breaks the habit formation process into 5 easy parts: Reminder, Routine, Reward, Rehearse and Record. Record your habit on your calendar so you can visually see your progress (it always feels good to see positive forward steps!). Following this simple process will help you to hack into your willpower and develop a strong foundation for your routine. 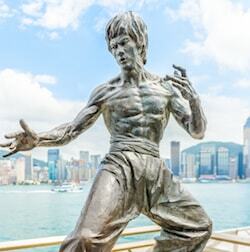 Another option is to take The Bruce Lee Challenge, a 5-step program created by Travis McAshan. Step 1 is to identify the goals you want to achieve and to break them down into little actions that you can take daily in order to reach them. Step 2 is where you reduce your goal to manageable, bite size pieces and come up with a way to measure how you are doing with it. For instance, it isn’t enough to say that you will incorporate exercise into your morning routine. You have to be specific, like deciding that you will walk on the treadmill for 20 minutes or that you will do 25 sit-ups, 10 push-ups, and 100 jumping jacks. Step 4 which is actually taking action toward your goal now. Not tomorrow or next week. Now. In other words, if you are able to attach a deep significance to a habit or something that you want to accomplish in your life, it will help you to overcome the inevitable obstacles and frustrations that show up along the way. What benefits do you personally expect to receive from creating a morning ritual? Is it to get in better physical shape as that is when you intend to exercise, completing your sessions before life can get in the way? Or maybe you want to become a morning person so you can get more done, thereby decreasing the amount of time you stress over your extra-long to-do list or worrying about how the day is going to play out with everything you have to do. No matter what your reasons, being fully and consciously aware of them will help make getting up early easier. It will also work in your favor when you are struggling and all you want to do is tap your snooze button, roll over, and tell yourself that you’ll try it again…tomorrow. How will this help your physical and emotional health? How will this help your career and finances? What it will feel like to know you stuck to it? Write out your answers. Get as specific as possible. Now that you know a few ways to establish the morning habit, let’s talk a little bit about what types of good activities you might want to consider for your morning routine. Free Bonus: Click here to get instant access to ’40 Positive Habits That Will Improve Your Mind, Body, Soul & Business;. 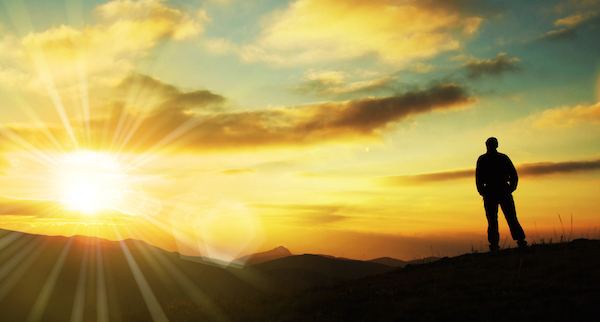 A free PDF worksheet with forty positive morning habits to help get you started. Plus two other exclusive bonuses. While all of these activities are great ways to start your day, creating a positive, results-producing morning routine also involves knowing what to cut out. I used to start my day with a bunch of habits that were not only useless, but also detrimental. Let’s take a look at just two of these and how they can negatively affect you. A recent survey found that more than 57 percent of Americans hit the snooze button each morning (and wind up spending three and a half months of their lives hitting snooze). One of the biggest problems with the snooze button is the mindset it’s putting you in first thing in the morning. If hitting the snooze button is the first action you take, you are starting your day off procrastinating (“I’ll wake up later”). You are effectively sending a message to your subconscious mind that you don’t even have the self-discipline to get out of bed in the morning. OK, so now that you know some of the ways to create good morning habits (and avoid some of the bad ones) let’s get into how to set yourself up for success before morning even arrives. Till Roenneberg, professor of chronobiology at Ludwig Maximilian University in Germany found that not getting enough sleep has a lot of negative consequences. For instance, it contributes to higher rates of obesity (which makes you tire more easily). It can also play a part in increasing your consumption of tobacco, alcohol, and caffeine – all of which are harmful to your health and your morning motivational levels! To overcome these unpleasant effects of lack of sleep, you can do a few things the night before to make your sleep more restful. You want to get your body ready for restful sleep too. So, don’t eat a lot right before bed or your body’s digestive process may keep you awake. Also, limit your alcohol consumption as drinking too much may help you fall asleep (or pass out), but the sleep you get is more restless. Plus, waking up with a hangover is not going to help you stick to your morning routine. Also, figure out what you will be wearing the next day so you don’t waste precious time in the morning standing before your closet just gazing at the clothes that are hanging before you. While you’re at it, you might even want to set out your exercise clothes so all you have to do is put them on when you get up, thereby encouraging you to stick with your morning exercise habit. Once you have everything set for the following morning, it is time to do something you enjoy and that relaxes you. Read a book. Take a bath. Listen to soothing music. Do something, anything, just for you that eases your soul. Although it may be tempting to spend the precious moments of pre-sleep time going through your email or watching Netflix, copywriter Neville Medhora suggests that you take an “Amish Hour” instead. “I make sure to complete the next days to-do list. I tell Siri to set my alarm for whatever time in the morning. Put my phone on the charger, but like 4 feet away from my bed….unreachable distance. I grab one of those $0.97 “composition notebooks” from Wal-Mart for taking notes. I grab the book I’m reading or (magazine or newspaper or whatever) and start learning! In other words, keep the hour prior to your bedtime electronics-free so that your mind can decompress. But what do you do if you have trouble sleeping? Getting the perfect night of sleep involves first realizing what your current sleep patterns are. You can do this quite easily by journaling. Some of the things you might choose to note are: what you did before bed, the time you went to bed, how long it took you to fall asleep, the approximate number of times you woke up, and how long it took you to get back to sleep. This will help you find patterns that you currently have in regard to sleep. Another option is to purchase a sleep monitor device which not only tells you how you sleep, but can also help you create healthy sleeping practices. Buffer’s Dave Chapman even bought one that reminds him when it is time to go to bed and wakes him up when he is in the sleeping stage when his body is more inclined to feel rested. Free Bonus: Click here to get access to a special PDF report with the 15 best tools, apps and videos to help you sleep. Once you have more insight into your sleep patterns, your next step is to take actions that result in better rest. According to the National Sleep Foundation, the most ideal sleeping temperature is right around 65°F (18°C). So turn your thermostat down before bedtime and you’ll likely sleep better as a result. Use room-darkening curtains to keep out any outside lights. This is even more important if you live in an area that has street lamps or if your house is at the end of a road where vehicle headlights routinely shine into your bedroom windows. Essentially, you want to create a bedroom that lulls you to sleep like a baby being sung a soft lullaby so that you wake up feeling refreshed, rejuvenated, and ready to tackle your morning routine! Now, at this point, you’re probably wondering what my morning routine looks like and if I actually practice what I preach. Right? I wake up early every morning (5 AM on weekdays and 6 AM on most weekends) and the first thing I say to myself is, “Today is going to be the best day ever!” This helps get me into a positive state of mind and gives my ‘morning demons’ a quick punch in the mouth. From there, I lower to my knees and give thanks, asking for help in making positive choices as I go about my day. I brush my teeth, use the bathroom, and wash my face with freezing cold water. I drink a glass of ice cold water to rehydrate my body. This is followed by reading inspirational content on one of my apps to help center and inspire me. I then do five minutes of stretching or yoga to get my blood flowing and my heart pumping a little faster (for stretching I use this app and for yoga, I’ll follow a YouTube video like this). The next 20 minutes are filled with meditation. And although I was really skeptical at first and didn’t think I could ever be someone who meditates, I can honestly say this one practice has been a life-changer for me, which is why I do it each and every morning. No excuses. After clearing my mind, I write three handwritten Morning Pages, a concept created by author Julia Cameron to “provoke, clarify, comfort, cajole, prioritize and synchronize the day at hand.” These pages are about whatever is on my mind that morning, and they are for my eyes only so I can be open and brutally honest. “Morning pages don’t need to solve your problems. They simply need to get them out of your head, where they’ll otherwise bounce around all day like a bullet ricocheting inside your skull. I then repeat a few positive affirmations out loud so my mind registers them fully. I create my daily plan and visualize myself being successful before sitting down to read one chapter of a book. After that, I work to come up with 10 new ideas to help build my creative muscles too. By this time, it’s usually about 6:45 or 7am and I then spend some quality time with my daughter and make breakfast for her and I. This time with her reaffirms that she is an important part of my life. Additionally, I do at least one thing to show appreciation to my wife so she knows how important she is as well. I call my mentor, updating him on my progress to help hold myself accountable (even if it means just leaving him a message. Once I’ve spent at least twenty-five minutes on that task, then I’ll take a quick break and finally check email. A lot of successful people attribute their high levels of accomplishment, in part, to creating and following morning routines. What do their routines look like? Motivational speaker Tony Robbins takes a different approach to his mornings. He gets into his Jacuzzi followed by immediately immersing himself in water that is a mere 57 degrees. He also utilizes a process called cryotherapy (in which your body temperature is decreased by nitrogen gases) for three minutes to “reset” his nervous system and relieve him of any inflammation he may have. Anna Wintour, the legendary editor-in-chief of Vogue magazine, wakes up at 5:45 AM each day to play an hour of tennis, after which her hairstylist arrives to blow-dry her bob, after which her driver takes her to the office. Whenever the answer had been ‘No’ for too many days in a row, he knew he needed to change something. Sidekick’s Scott Tousley began asking himself the ‘Steve Jobs question’ every morning and found that it helped him to eliminate insignificant problems and prioritize important goals. Benjamin Franklin’s morning to-do list highlighted a specific routine as his notes reflect that he set out to “Rise, wash, and address Powerful Goodness; contrive day’s business and take the resolution of the day; prosecute the present study; and breakfast.” Starting your day with positivity, the creation of business, and breakfast? What a great combination! DJ Justin Boreta, one of the founding members of the Glitch Mob, has a morning routine that works for him as well. In a recent interview he did with Tim Ferriss, Boreta revealed that he doesn’t look at his phone or computer for the first 60 minutes he is awake. Instead, he drinks a cup of tea, spends 20 minutes engaged in transcendental meditation, does a quick workout (like kettle bell swings), eats breakfast, and then reads for another 20 minutes. When I set out to change my morning routine, I had an all-or-nothing attitude. So I set my alarm for 5 AM, even though I was used to getting up a couple hours later at the time. Through sure pig-headed determination, I was able to maintain it but I hated life at the time. I don’t recommend taking this route. I really struggled at first and wanted to give up many times. Plus, I have seen more successes with people who have taken a slow and gradual route. To begin this process, you could set your alarm just 15 or 30 minutes earlier every day next week to let your body slowly acclimate to rising earlier. From there, continue to move up your time weekly in these small, yet doable increments until you’re at your goal wake-up time. Or, you can simply decide to stop hitting the snooze button next week, (as we’ve already talked about) which is a really good move since there are a number of negative consequences to snoozing on a regular basis. These include having a harder time waking up, finding it more difficult to complete relatively easy tasks (like finding your way to the bathroom without stubbing your toe), and even limited cognition about what is going on in the world around you. Another good initial goal to consider adding to your morning routine is the simple saying of a positive affirmation. Or perhaps you will decide that it will be enough to start by just making your bed once you get out of it, something that U.S. Navy Admiral William H. McRaven stressed in his University of Texas commencement address. He believes that this one small activity helps you start your day with a sense of accomplishment that will drive you to continue to achieve much more as your day progresses. If you’re someone who likes doing things according to a time-based schedule, then you might find that you enjoy minute-based morning routines. Hal Elrod’s created a condensed version of his system in something he calls the ‘6-minute Miracle Morning’: Take one minute to sit in silence followed by a minute of affirmations. Minute three consists of visualizations, whereas minute four is spent writing down the blessings in your life and declaring what you intend to do for the day. 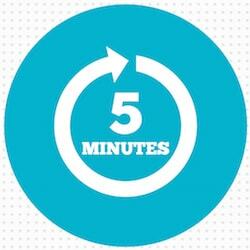 Read something short for the fifth minute and then spend your final minute doing 60 seconds of quick exercise. Follow this quick morning routine and you will have tended to your health, mind, and body! Once you’ve got your morning routine set the way you want it, the next obstacle is making it stick. This is the part where a lot of people struggle. Essentially, you want to think of all of your morning routine activities as building blocks and start stacking them one on top of the other until you get exactly where you want to be. While it may take a bit longer to go slow and tackle them one at a time, you are setting yourself up for success and creating a stronger foundation to build upon. One suggestion for stacking habits and making them stick is to follow Benjamin Spall’s “Only 5 Minutes” way of thinking. Tell yourself that you’re going to do one of your morning habits for only 5 minutes. The reason this works is that this length of time is so minimal, your brain won’t likely object. And once you start doing it, it is easy to go beyond the 5 minutes and reach your objective, putting you one step closer to your goals. Barrie Davenport also states that stacking habits can also mean taking other small actions that bring about huge results when you start adding them together. Some of these small but powerful actions include waking up 5 minutes earlier, drinking a full glass of water (while taking your vitamins), flossing (yes, your teeth are important too), visualizing your goals, and saying “I love you” to your family members. Simple, right? In his piece, Wake Up! 8 Game-Changing Habits That Will Supercharge Your Morning Routine, Kyle Towers provides more positive stackable morning habits which include taking deep breaths to relax and center yourself, giving yourself a scalp massage, and oil pulling (where you swish coconut oil around your mouth to remove toxins). In 9 Morning Habits That Will Change Your Life, Monika Carless suggests drinking a cup of hot honey and lemon water, performing yoga while still in bed, and stepping on your front porch to view the world. Make good use of your mornings by creating a wide variety of small habits that only take a couple minutes each. This might mean tending to little issues before they get too big or reviewing your goals. It could mean opening blinds to let sunlight in, popping a mint in your mouth to increase your alertness, listening to your favorite music, or sharing positive messages with family and friends. Have fun with it. Anything works as long as it is positive and keeps you moving toward your overall goal! And there are a lot of potential options to consider because everyone has their own individual variations of a positive, success-inducing morning routine. For instance, some people swear off emails until after 9 or 10 AM and some check them first thing. Some spend their mornings focused on themselves and other spend them focused on growing their business. If you try a particular activity and it doesn’t feel like it is working for you, don’t be afraid to change it. No one says that you have to continue to do something just because you said you would. Instead, figure out why it feels wrong and make adjustments until it feels better. Even the best devised plans need to be changed sometimes. Now, if you’re still worried when you think about getting out of bed while the sun itself appears to still be sleeping, let me say one thing: Establishing a morning routine doesn’t necessarily require that you get up at 4 AM. If that is your goal wake-up time, then that’s fine. But morning routines can start at any time you decide you want to wake up. From there, add in the activities that suit you best depending on your goals. Just be sure to pick ones that give you control over your day and empower you versus engaging in activities that will dictate your day to you and drain your energy. In other words, use your early morning energy to start small and stack your habits so that they are manageable…and stick with you for a lifetime. In the end, know that nothing changes until you do. So, if you want a better, more fulfilling, happier life full of amazing successes, then you have to do something that will get you there. Ready to create YOUR perfect morning routine? I’ve created a special bonus section for this guide to help make things even easier. – Get instant access to this exclusive list of habits & resources that you can try for yourself. – Tools, apps, resources, quizzes, videos and so much more…all designed to help you get a great night of sleep. – Yours to save and access whenever (and wherever) you are. Click the image below to access to the exclusive Bonus Area now. What an excellent resource and perfectly timed as I’m moving house on Monday and I plan to make my morning ritual a habit. Thanks Joe — so glad it was helpful for you! Re: Habitica — do you use it on a daily basis? I’m curious how sustainable it is and what you like (or don’t like) about it. I haven’t managed to yet. I was when I posted the comment but then I moved house and things got in the way. I’ll give it another try and as I liked the idea. I’ve been using Habitica daily since the end of March and I must say it’s still awesome! What I love: I wanted to use stairs instead of an elevator, so I put that into Habitica and later was amazed how well this works. Just putting it there made me aware of my decision process and the vision of me ticking this habit and receiving gold/experience pulled me towards stairs. The more I used stairs, the easier and automatic it was. I also love the concept of dailies, because it lets me see the regular tasks I want to do every day (for example cleaning inbox in Todoist and Evernote, washing dishes before going to bed etc.) and makes me actually do them. If the carrot (reward in gold and experience) doesn’t work, I can join a party with my friends and whenever I don’t do my dailies, I get hurt and my friends get hurt as well (stick). That’s not a pleasurable feeling and in order to avoid it I work extra hard to do the dailies. What I don’t like: I’d love to see a better to-do management. Currently I’m using Todoist and loving it deeply. If I was able to use only Habitica for my tasks, habits and dailies, that would be absolutely fantastic. And the app (at least for Android) doesn’t provide the best user experience. I can’t even begin to explain how badly I needed this guide Chris. I hate mornings but i am so much more productive when I wake up early and do stuff but I’ve just never been able to do it consistently. I think this is going to help me to finally make it a part of my life. One quick suggestion…instead of saying “I hate mornings”, start saying “I love mornings” (or even “I like mornings”). It’s okay if you don’t actually love morning yet but it will start to change your thoughts about morning time all together (especially if you are realizing the other benefits of a productive morning). This is just what I needed Chris, going to grab a cup of green tea and dig into it! Keep up the great work. Awesome Mohit — let me know how it goes for you! I have been wanting to get some consistency with my mornings but I always wind up giving up at some point. I think it’s because I try to do to much right away. So I’m going to follow your advice and start slow! Definitely keep it simple Johnson. Start small. Get some consistency and small wins and then build on that. This guide should be in lights. it came at a very crucial time in my life when I needed focus, simplicity and results. Thank you Chris. Wow, thanks Sonia 🙂 Let me us know how it goes for you! I love this! Tweeted it! Priceless Moments Brought to You by NYC! That’s awesome Lee — thanks! This is good, I’m going to try it because a post it is not too big so I’ll only put the most important things, as you suggested and won’t get too overwhelmed and therefore end up doing nothing. Over the last 12 months I’ve honed a evening/morning ritual that allows me to get up anywhere from 5:30-6:00 AM 5 days a week. -Gain ~480 hours/yr. to work on my blog/business that I would have spent asleep. -That’s the equivalent of 20 EXTRA days a year…whoa. • I put my alarm (an old pebble smartwatch with an insane vibe motor) inside of a wooden box with a combination lock. • I put a 16 pound wooden block on top of the box. • Type any tasks into Asana so I don’t waste valuable cognitive resources on task-deciding in the morning. • In bed by ~10:00 PM every night. • Alarm buzzes obnoxiously like someone gleefully jackhammering into my soul. • I walk over to the other side of the room and lift the 16 pound weight off the box. 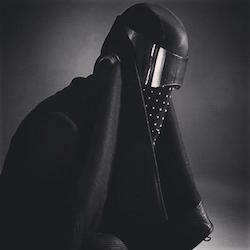 • I undo the combination lock. • I silence the alarm. • After 2 hours I make breakfast (4 eggs, raw sauerkraut, bacon, almond butter, and chocolate chip waffles…because I DGAF. • Now that I have these behavioral triggers set up, I know that I can “pull the levers” earlier or later. If I have a early day I can easily scale back to 5:00 AM, etc. • I’ve noticed that as I wake in the morning, I have better results if I “suspend my thinking” until my waking ritual is over and I’m out of the bedroom. • I think the reason this works is because I can be on auto-pilot and I am far less likely to rationalize going back to bed. • When I first started, I did all this WITHOUT the expectation of getting ANY work done for 5 days. This helped me build the behavior without any guilt over not being productive. Thanks for this massively awesome post, Chris. It’s amazing how much of a difference a winning morning routine makes. You’re writing has really helped me make some positive changes. Your article make me feel good, alot of new information and resources that can improve morning routine. Thank you so much! Thanks so much! Loved the post. How long is your morning routine and should there be a maximum amount of time for your morning routine? I know some people who workout for an hour in the morning and that makes their routine longer. This guide is just brilliant, I don’t really have a problem with mornings, I was doing the Miracle Morning routine, but lately iv’e not been doing it, your guide will hopefully give me the kick I need to start this regime again. Wonderful tips- Thanks for sharing! These are great!! I wrote about one more thing to do in the morning to jump start your day! Check it out!! I like your suggestion of starting small and then building from there. Creating a morning routine that sticks doesn’t usually happen overnight, so any small yet effective tactics are always great. Speaking of, my team wrote an article about hacks to implement into your morning routine: https://zenkit.com/en/blog/5-productivity-hacks-to-sneak-into-your-morning-routine/. Worth a read if you were looking for ways to start out.